In this post, I want to share some examples of data visualization I was playing with recently. Like in many other occasions, my field of application is digital analytics data. Precisely, data from Google Analytics. You might remember a previous post where I built a tentative dashboard using R, Shiny and Google Charts. The final result was not too bad, however the layout was somewhat too rigid since I was using the command "merge" to merge the charts and create the final dashboard. So, I thought to spend some time improving my previous dashboard and include a couple of new visualizations, which will be hopefully inspiring. Of course, I am still using R, Shiny, and in particular shinydashboard: an ad hoc package to build dashboard with R.
Let's go quickly through each visualization to see what Google Analytics dimension/metrics it shows. When you build a dashboard, boxes are probably the main building blocks since they allow organize the information you want to show within the page. When I build a dashboard, I normally start by sketching the layout, and this means placing the main boxes. A particular type of box available in the Shiny Dashboard package is the valueBox, which lets you display numeric or text values, and also add an icon. Value boxes are great components to be placed at the top of a dashboard and display main KPI's, change % or add a description to the rest of the dashboard. Time series charts might get chaotics and not provide clear insights when filled with too many data and series (you might end up with the so called "spaghetti-effect"). But if time series are interactive, user can easily explore and make sense of complex datasets. 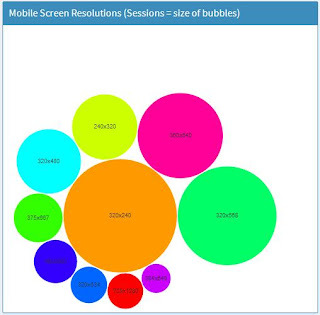 With bubble charts you can show three dimensions of data. I used a bubble chart to visualize the performance of traffic channels: x axis represents the number of sessions, y axis thee avg. pages per session, and finally transactions (that is the ultimate objective of many websites) are proportional to the size of the bubble. The larger the bubble and the higher is the number of transactions produced by that channel of traffic. To make this chart I used the GoogleVis package. In the dashboard I've also included a one-dimensional bubble chart using the bubbles library. This type of chart works similar to a bar chart though the latter is more accurate in terms of understanding the real value you are showing. On the other hand, this bubble chart might look more attractive than bar charts and it allows to display lots of values in a small area. I used this chart to show screen resolutions data from Google Analytics mobile reports. Streamgraphs are a type of stacked area charts that are displaced around a central horizontal axis. Stremgraphs are very effective to visualize data series that varies over time, especially if you need to show many categories. The result is a flowing, organic shape, with strong aesthetic appeal, which is why streamgraphs are becoming more and more popular. 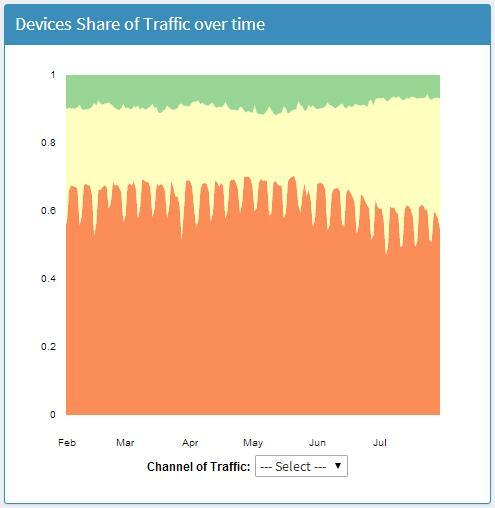 In the dashboard I made a streamgraph to visualize the evolution of sessions among devices (desktop, mobile, tablet) over the past years. To do it in R. I had to play a bit with the streamgraph package. Here below is the final data viz (I am not completely happy with this visualization as for some reason when I mouse over the series the value showed is always the total of the period, not the one of the specific date I am pointing on. Any help?). Another interesting application on web analytics data, would be using streamgraphs to analyse channels share of traffic over time (direct vs organic vs paid vs referral, etc.). Treemap visualizations are very effective in showing hierarchical (tree-structured) data in a compact way. They can display lot of information within a limited space and at the same allow users to drilldown into the represented segments. 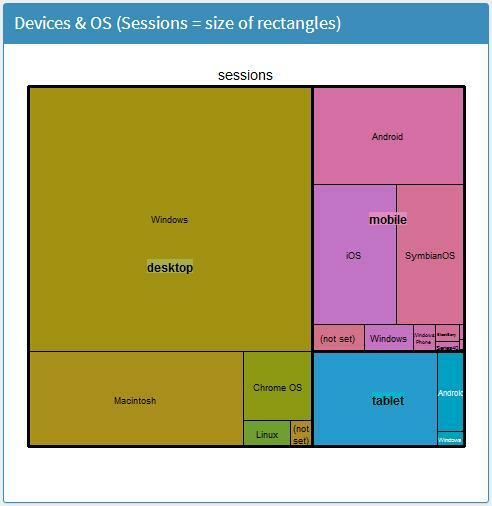 An example of hierarchical data in Google Analytics reports, is devices as principal segment (main rectangles) and browser as sub-segment (nested rectangles). 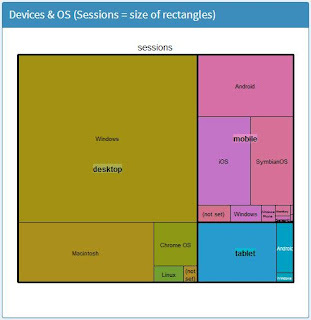 The area of each rectangle is proportional to the amount of sessions produced by its corresponding segment/sub-segment. To make in R, I used the treemap library (unfortunately the visualization is not interactive, but you can have a try with the d3treeR library). I hope you can get inspiration from these visualizations and include some of them in your digital analytics dashboard or reports. My plan is to keep adding more interesting visualizations (that are not currently offered in Google Analytics reports) to this dashboard, to better show digital data. If you have suggestions please leave a comment here or share it via github repo.